This page provides guidance and recommendations for determining the appropriateness of infiltrating stormwater in a Drinking Water Supply Management Area (DWSMA). For more information on source water protection see Minnesota Department of Health. Example map illustrating different protection designations for public supply wells with wellhead protection plans. The figure at the right illustrates protection designations used to manage public water supply wells that have wellhead protection plans. Drinking Water Supply Management Area (DWSMA) - the surface and subsurface area surrounding a public water supply well, including the wellhead protection area, that must be managed by the entity identified in a wellhead protection plan. This area is delineated using identifiable landmarks that reflect the scientifically calculated wellhead protection area boundaries as closely as possible. Drinking Water Supply Management Area Vulnerability. An assessment of the likelihood that the aquifer within the DWSMA is subject to impact from overlying land and water uses. It is based upon criteria that are specified under Minnesota Rules, part 4720.5210, subpart 3. Emergency Response Area (ERA). 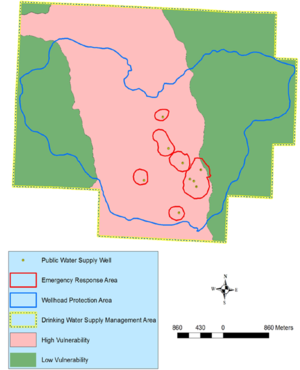 The part of the wellhead protection area that is defined by a one-year time of travel within the aquifer that is used by the public water supply well (Minnesota Rules, part 4720.5250, subpart 3). It is used to set priorities for managing potential contamination sources within the DWSMA. This area is particularly relevant for assessing impacts from potential sources of pathogen contamination because this time of travel is believed to closely correspond with the survival period of many pathogens. Public water supply well – a drinking water well as defined in Minnesota Statutes, section 103I.005, subdivision 21, that serves a public water supply. Time of travel - means the amount of time over which groundwater will move through a portion of an aquifer to recharge a well in use. Note this definition does not consider travel time within the unsaturated (vadose) zone. a combination of the materials specified in units (a) to (d). Wellhead Protection Area (WHPA) – the surface and subsurface area surrounding a well or well field that supplies a public water system, through which contaminants are likely to move toward and reach the well or well field (Minnesota Statutes, section 103I.005, subdivision 24). 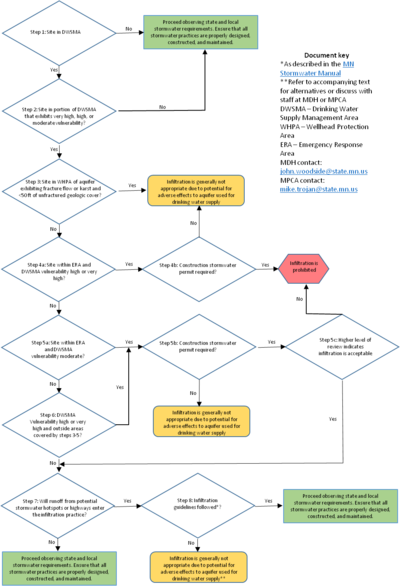 Flowchart for determining if stormwater infiltration is appropriate in DWSMAs. To see an enlarged image click on the image and then click again on the new image. The Minnesota Department of Health and Minnesota Pollution Control Agency developed joint guidance for determining the applicability of infiltration in a Drinking Water Supply Management Area (DWSMA). A step-by-step process for determining if infiltration is allowed and appropriate in a DWSMA is shown on the right. Is the site located in a DWSMA? If No, proceed with infiltration observing state and local stormwater requirements. See additional requirements and guidance below. 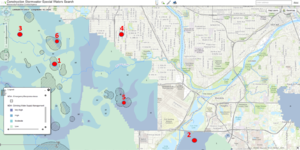 Is the site in a portion of the DWSMA that exhibits very high, high, or moderate vulnerability as defined by Minnesota Rules (4720.5100-5590)? If No, proceed observing state and local stormwater requirements. See additional requirements and guidance below. Is the site in the Wellhead Protection Area (WHPA) of an aquifer exhibiting fracture flow or karst conditions and that has less than 50 feet of unfractured geologic cover? If Yes, infiltration is generally not appropriate due to the potential for adverse effects to the aquifer used for drinking water supply. Is the site within the Emergency Response Area (ERA) and is vulnerability of the DWSMA very high or high? Is a Construction Stormwater General Permit required? If No, infiltration is generally not appropriate due to the potential for adverse effects to the aquifer used for drinking water supply. Consider other stormwater handling procedures such as stormwater retention and conveyance outside of the WHPA or moving the infiltration area to a non-vulnerable part of the DWSMA. For more information, discuss with MDH subject matter experts or the hydrologist or planner for the DWSMA or with stormwater staff at the MPCA. Is the proposed infiltration site within the ERA and the vulnerability is moderate? Has a higher level of engineering review been performed and if yes, does the review indicate that infiltration is acceptable? Is the proposed site outside the ERA and the vulnerability is high or very high? Will runoff from Potential Stormwater Hotspots (PSHs), as defined in the Minnesota Stormwater Manual, or runoff from highways enter the infiltration practice? Are infiltration guidelines for stormwater hotspots as defined in the Minnesota Stormwater Manual followed? If Yes, proceed observing state and local stormwater requirements. See additional requirements and guidance below. The following requirements and guidance apply to infiltration practices regardless of whether the site is located in a DWSMA. If the site requires a Construction Stormwater General Permit, stormwater infiltration is prohibited in the following areas regardless of whether the site is located in a DWSMA. The following are recommendations for infiltration practices in a DWSMA regardless of whether the above step-by-step process indicates infiltration is appropriate or a Construction Stormwater permit is required. Ensure that separation distances are met and that existing or proposed structures or infrastructure (e.g. rate control BMPs, utilities, buildings, roadway, easements) do not prevent infiltration. If there is a potential for the high water table or bedrock to be within 6 feet of the bottom of proposed infiltration practices, follow guidelines in the Minnesota Stormwater Manual for conducting site investigations and managing infiltration in these areas. If there is the potential for presence of contaminated soils, contaminated groundwater, and/or hotspot runoff, follow guidelines in the Minnesota Stormwater Manual for conducting site investigations and managing infiltration in these areas. If there is a potential for presence of soils with steady-state infiltration rates less than 0.2 inches per hour, follow guidelines in the Minnesota Stormwater Manual for conducting site investigations and managing infiltration in these areas. If infiltration could result in adverse surface water hydrologic impacts, such as impacting a perched wetland, minimize infiltration to a point where adverse surface water hydrologic impacts are avoided. If the infiltration practice is constructed in industrial, commercial, or transportation land uses, ensure that emergency procedures for containment of spills are established and acceptable. Infiltration is not allowed in areas that receive discharges from vehicle fueling and maintenance. Infiltration is not recommended in areas that receive discharges from industrial facilities that are not authorized to infiltrate industrial stormwater under an NPDES/SDS Industrial Stormwater Permit issued by the MPCA. Infiltration is not recommended in areas within 1,000 feet up‐gradient, or 100 feet down‐gradient of active karst features. If infiltration is being considered, follow stormwater management guidelines for karst areas. Infiltration is not recommended in areas where soil infiltration rates are more than 8.3 inches per hour unless soils are amended to slow the infiltration rate below 8.3 inches per hour. Using the MPCA mapping tool, go to the site of interest by magnifying the image or entering an address. In this example, six sites are shown. Make sure the Legend (lower left) displays the proper legend. Infiltration is acceptable at site 1 because, even though it overlies an Emergency Response Area (ERA), the site is located in an area with low vulnerability. Infiltration is prohibited at site 2, unless a higher engineering review indicates infiltration is acceptable, because it is a DWSMA with high vulnerability. Infiltration is acceptable at site 3 because it is not in an ERA and is in a low vulnerability DWSMA. Infiltration is acceptable at site 4 because it is outside an ERA and DWSMA. Infiltration is prohibited at site 5 because the area overlies an ERA and vulnerability is high. Infiltration is prohibited at site 6, unless a higher engineering review indicates infiltration is acceptable, because the site overlies an ERA in a moderate vulnerability session. The MS4 mapping tool includes a coverage illustrating DWSMAs and their vulnerability. For more information, see Guidance for using the Stormwater Special and impaired waters search tool. Shapefiles and maps showing DWSMAs, DWSMA vulnerability, Emergency Response Areas, and Wellhead protection Areas can be found on an MDH website. This page was last modified on 8 January 2019, at 17:17.